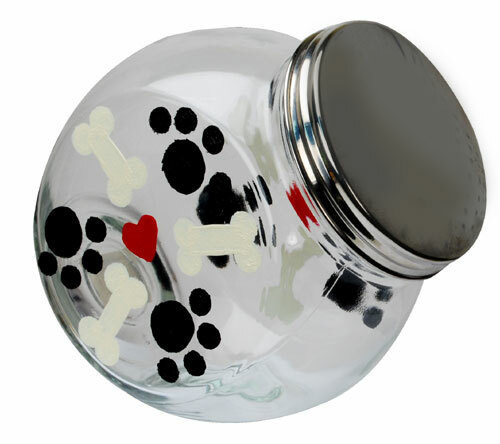 Give man's best friend his own Dog Treat Jar with enamel paint paw prints. These jars are cute and easy craft projects for dogs, and will surely bring a smile to your pet's face! DAG164 - Light Buttermilk --- NEW!! DAG265 - Tuscan Red --- NEW!! Refer to photo for placement and use large pouncer dipped into Black to paint large paws on each flat side of jar. Use small pouncer and Black to stamp four small dots by each large one. With shader brush, paint Light Buttermilk lines for center of bones. Use small pouncer and Light Buttermilk to stamp two dots on each end to complete bone shapes. Use round brush and Tuscan Red to paint heart at center of bones and paw prints; let dry.